My Calgon moment involves sitting down with a dessert — maybe a brownie, or a piece of cake — and some milk. Usually Burrito and Tamale have gone to bed for the evening, but sometimes I’ll take this break from life during nap time. There’s a marvelous moment with the first bite: it’s quiet, and I am all alone with no immediate demands on me, and aaaaah. The moment is just as sweet as the food. What is your Calgon moment? One theme I’ve seen come up over and over again in the Dollars and $ense posts is money spent on failed cycles and other efforts that didn’t pan out. Some people seem to accept it as a necessary part of the process. Other people seem to lament the waste. I’ve referred to it in my own post and in a blog post years ago as water-under-the-bridge money, and for the most part that’s how I’ve approached it. Some people are prudent in their approach to sunk costs, cutting their losses and moving on. Others keep going because of the resources already invested, even when it doesn’t make any sense to keep going. Eating something that tastes horrible? Halfway through watching a terrible movie? Paid thousands of dollars in repairs for your crappy car? Invested a couple of years in a bad relationship? Spent tens of thousands of dollars and years of your life trying to have a baby? With the little things, eating something yucky or watching a bad movie, I’m likely to just finish, even though it would be wiser not to. When it really counts — relationships, big ticket items — I think I’ve been good about cutting my losses. With infertility, though, I was in between: I accepted the losses as water under the bridge, but I couldn’t ever bear to cut my losses and move on. The hard part is that during infertility, you don’t know whether you’re showing perseverance necessary for achieving your goal, or whether you’re succumbing to the sunk cost fallacy and throwing good money after bad. Of all of the awful things about infertility, that part — not knowing if you will ultimately succeed if you just keep going or if everything you put in will ultimately be wasted — is, to me, the very worst. When there are sunk costs, do you move on or try to stick it out? 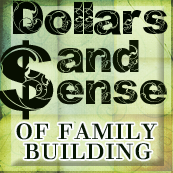 How does your typical sunk cost approach relate to your family building efforts? With my magnificent spreadsheets and several enormous folders of receipts that I didn’t have time to organize, on two hours of sleep, DH and I went to meet with the auditor. We were on time, but after going through the metal detector and wandering all around the federal building (apparently someone should tell those security guards that “the IRS is on the 3rd floor” doesn’t apply to the audit department), we were 15 minutes late. I was pleasantly surprised to find that our auditor was not the humorless bureaucrat that television had taught me she would be. She was a regular person. The first thing she said was that she understood what a difficult situation it was to be in, but that we didn’t need to freak out. Very human. Awwww yeah. I am the queen of the dorks. Tomorrow, the auditor’s reaction to our medical bills. As the date for our appointment with the auditor approached, I still hadn’t gathered most of the paperwork nor organized everything into spreadsheets that someone else could understand. I figured that since I’d already organized and tallied everything when I did the taxes originally, it wouldn’t take long. The night before the appointment, I stayed up almost all night putting everything together. It’s not like the government knocks a couple thousand dollars off your taxes for superb organization, but I can’t help it. It’s who I am. My spreadsheets were magnificent. Or rather, most of the spreadsheets were magnificent. The last one was slapped together — not even good enough to be called half-assed. Quarter-assed? Eighth-assed? I’d become too bleary-eyed to make any sense, so I decided to get a couple of hours of sleep. Stay tuned to hear what happened when we met the auditor. Another part of the audit prep involved figuring out all of the various visits to the RE, hospital, and acupuncturist during the year in question. When you have enough medical expenses to warrant a separate deduction (a mixed blessing, to be sure) you get to include mileage for each of your doctor visits. When I’d prepared our taxes, I did a rough estimate. Reasonable, but rough. Now, I needed a more careful record. When I add it all up, it turns out to be even more than my rough estimate. The total is well over 3000 miles. I drove over 3000 miles for infertility appointments in one year. If I’d traveled that distance all at once, I could have gone to France instead. Or, I could have gone to the North Pole. Maybe Santa Claus would have granted my wish for a baby. Stay tuned for more audit “fun,” all leading up to an exciting bloggy event next week!